The requirement for the present day soldier to physically move stores and equipment on a regular basis has been greatly reduced as a result of the military’s improved mechanised capability. However, when mechanical means fail or are not available, manhandling can become a paramount operational requirement. Poor techniques in the untrained will result in inefficiency, rapid fatigue and injury. 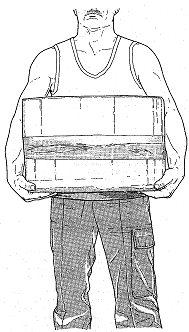 The principles and techniques of manual material handling should be included into the physical training programme on a regular basis. Only after being taught the basic techniques and given the appropriate physical conditioning should the more special to arm techniques be taught. Body Weight: manual work can be done by simply using body weight. A heavy person may only have to lean on something to get it moving. However the static use of body weight may not provide enough force. When the body is moving it has momentum and provides kinetic energy for doing work. Thus additional force is available if body weight is used dynamically (with movement). Skill: co-ordination and timing contribute to the technique and have to be practised regularly in order to maximise the strength available. Muscle Action: the ability of muscles to contract against resistance is an essential component of strength. A muscle contracts in two ways, isometric and isotonic. When a muscle works to produce movement at a joint it is working isotonic, when there is no movement taking placed the muscle is working isometric. Both forms of muscle action occur during manual work and it is particularly important that the muscle required to produce the work are properly conditioned. Range of Movement: the strength available for manual work is enhanced by joints that allow a full range of movement. The forces induced in the spine on bending down to lift are greatly increased because the muscles of the back and hips are then working at a mechanical disadvantage of 6 to 1. The reaction in the back muscles induces a compressive force which is resisted by the vertebral bodies and discs. It is known from experiments in which the resistance to compression of the vertebrae and the discs have been tested, that compressive failure does occur particularly in immature or elderly spines resulting in prolapsed discs and crush fractures of the vertebral body. Intra abdominal pressure is brought about by a contraction of the abdominal muscles, which reduce the forces on the spine during lifting. 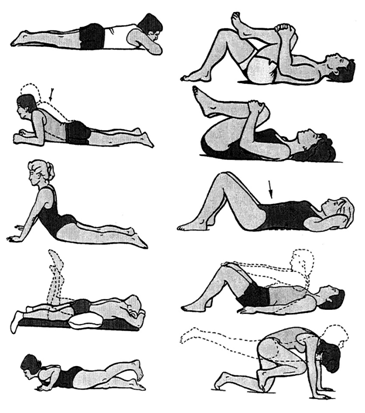 This counteracts the action of the back muscles and helps stabilise the spinal column. The heavier the weight or the faster a weight is lifted, the greater the pressure increase on the spine. This pressure increase is a perfectly normal function during a lift and occurs while the breath is held and for a few moments later. Figure 2 illustrates some strength exercises which will aid lifting and carrying ability. Controlled expiration during a heavy lift will help avoid an excess of intra abdominal pressure and also maintain a normal blood flow to the brain. This in turn will reduce the risk of fainting. The protection afforded by the increase in intra-abdominal pressure may prove to be an insufficient safeguard if the spine is twisted or bent sideways when lifting. This is because the added tension in the ligaments and muscles is considerable when the spine is rotated and increases the total stress on the spine to a dangerous extent. Feet: ideally these should be placed hip width apart with one foot slightly ahead of the other in the direction of movement. This position will give good balance and a wide enough base to perform the lift. Knees Bent: it is important to bend the knees. The strength of any lift is influenced by the correct bent knee position with the objective being to gain the most effective power from the thigh muscle, i.e. the middle range of the knee movement. The lift should ideally be started at the beginning of the mid-position and continued until the legs are fully extended to gain the maximum benefit of strength and power. 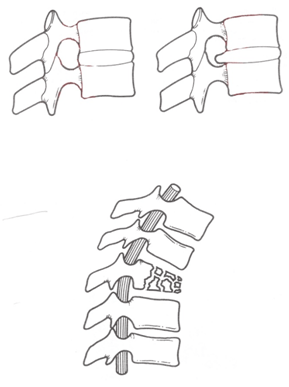 Back Straight: the spine must be kept rigid and straight but not necessarily vertical. This, coupled with a bent knee position, allows the line of gravity of the body to be over the weight, so reducing the strain on the spine. Weight Close to the Body: the weight should be held as close to the body as possible in order to minimise the strain on the back muscles. Hand Contact: objects lifted should be grasped firmly ensuring good contact with the palms of the hands. This reduces the possibility of objects slipping and utilises all of the muscle groups of the hand more efficiently. Chin Drawn In: every lift should begin with the head in the correct position for lifting. The head should be extended upwards and the chin drawn in to the neck. This will add rigidity to the spine and prevent the tendency to adopt a “bottom out” posture when lifting.